Some of you may have cottoned on to the fact that I’d made secret plans to make a return journey to see more of the Great Ocean Road after visiting my friend Charlie down in Lorne. A few weeks ago I received a text from Charlie to tell me that her friend Romina was in the neighbourhood and wanted to see the 12 Apostles and would I like to join? Would I! I’d even arranged leave from work, not that it turned out to be necessary. The weekend came around and following a last minute, desperate rush to acquire a tent (Sarah and Matt save the day again!) I made my way to Southern Cross Station to experience the joy of Victoria’s rail replacement service and made my way down to Lorne again. I met Romina at the bus stop in Lorne and we grabbed some lunch while we waited for Charlie and her boyfriend, our driver for the next few days, Kyle. 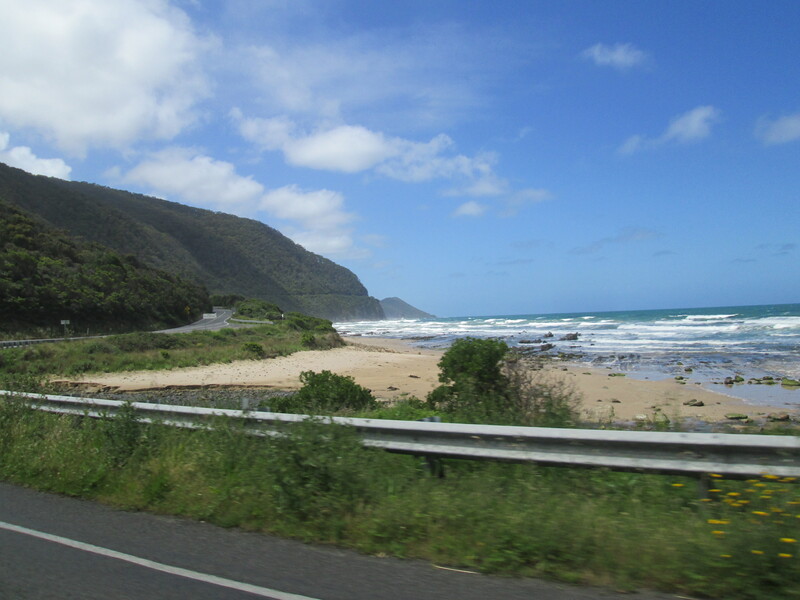 It didn’t take long for us to be on the road and begin winding along the rugged Victorian coast line. Our first destination was to be Kennet River, the reason for this being that I’ve not really seen much in the way of wildlife since I’ve been in Australia. Kennet River is famous for it’s koalas and as we pulled into the small coastal village it took less than 10 seconds to spot the first. There were two guys just hanging out in the trees right by the road and, as if this wasn’t exciting enough, there were a load of parrots and children with seeds! 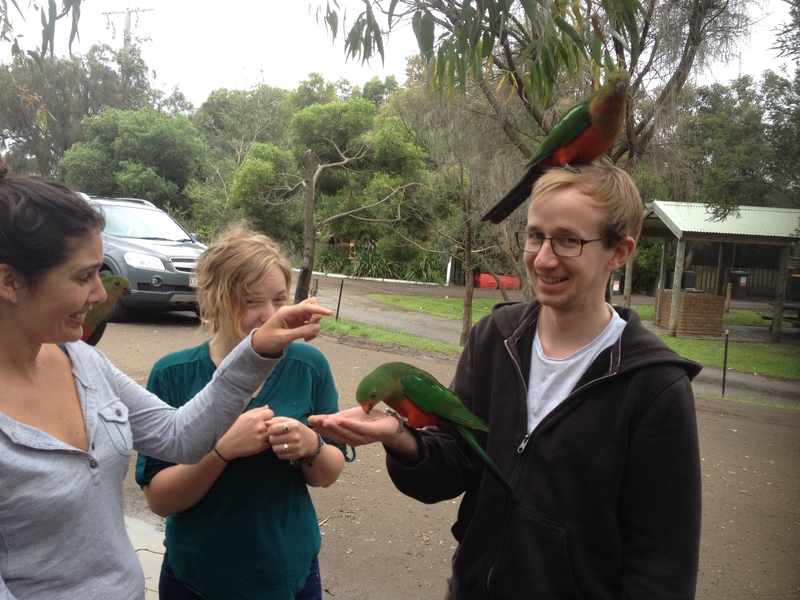 What followed was a not unreasonable amount of fun with birds flying into our hands and onto our heads to feed. Once we’d run out of bird-seed we decided to go off road for a bit and take a route up through the bush and away from the coast. This turned out to be the first of many master strokes as we rounded a corner and saw a small, cat like creature walking in the middle of the road. 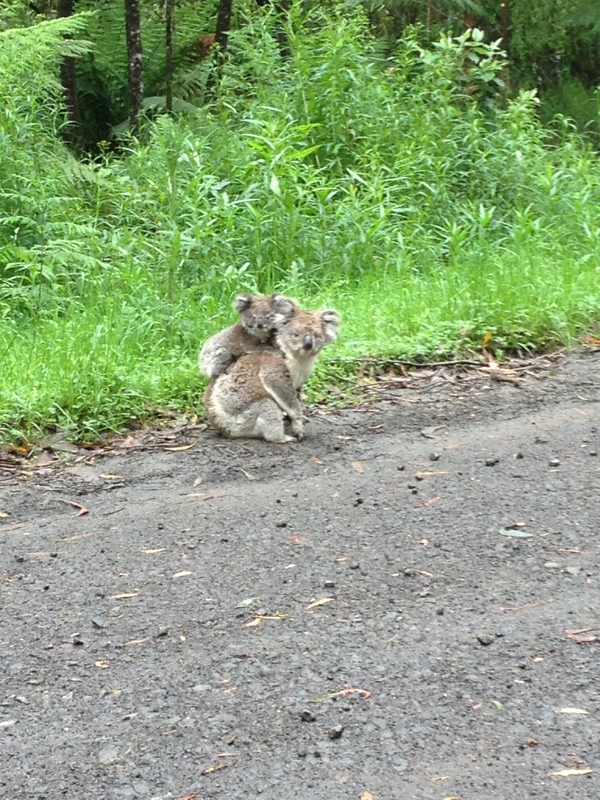 As we got closer, it stopped, sat down and turned to face us; a mother koala with baby on board. Having only ever seen koalas in the trees, looking somewhat lethargic in the past I was amazed to see one walking about on the ground. 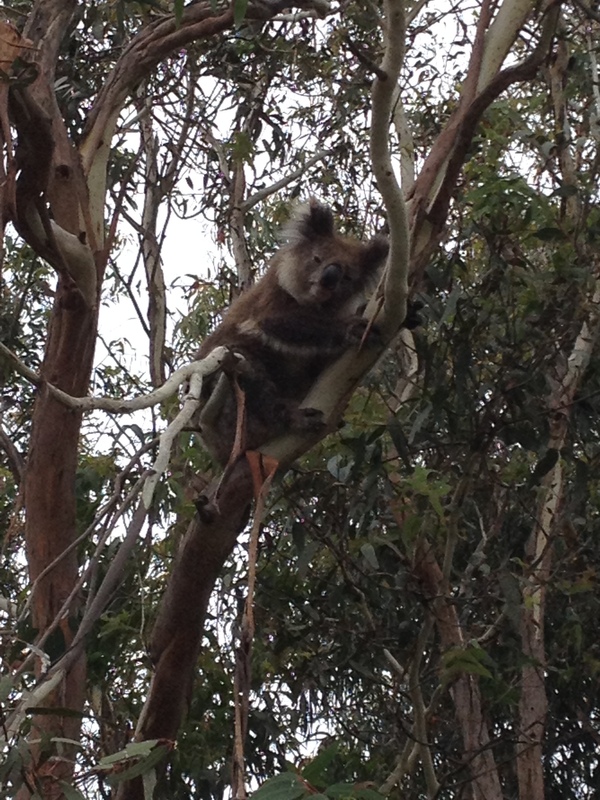 After a few quick snaps, the mother left the road and headed up a tree to munch away on some eucalyptus leaves. Our journey then continued as we emerged back on to a real, sealed road and made our way back to the Great Ocean Road and Apollo Bay where we would stop for snacks and a toilet break. Our journey continued as we started to make plans for where we wanted to end up that night. Charlie had picked up a list of free campsites around the area and we settled on Johanna and began making our way through the Ottway National Park. As we approached I made the shout to take a detour to visit the lighthouse which led us to yet more koalas and my first sighting of wild kangaroos but ended in ultimate disappointment as the park had closed for the evening minutes before we arrived. 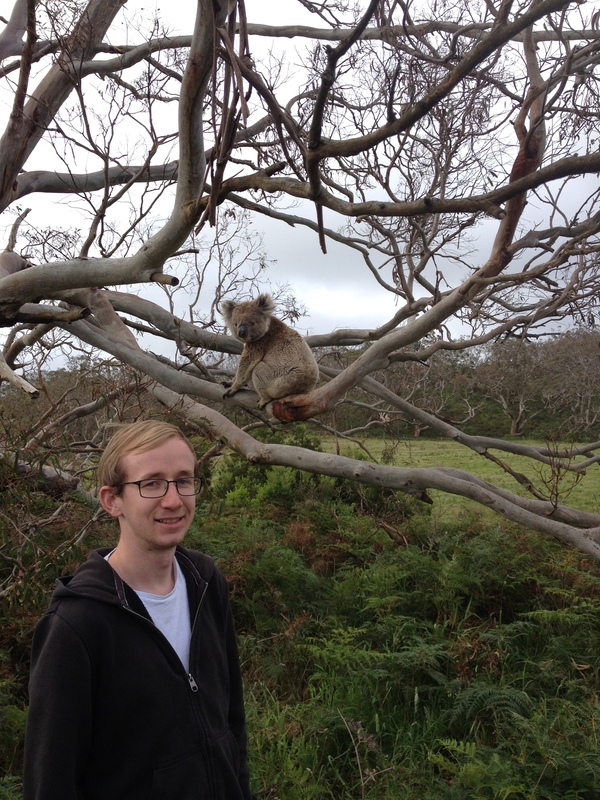 I say disappointment like more koalas is some kind of a bad thing. On we went, stopping at a beach along the way before finally arriving at the free campsite in Johanna. The road that led us away from our main route through was a narrow, 8km winding lane that made British country lanes look like a lovely drive. Kyle handled the driving like a pro, and would continue to do so for the length of our trip. Once settled, we battled to put up what I have already deemed the worst tent in history. After some friendly conversations with helpful campers and the belief that “there’s nothing ductape can’t fix” a simple repair job was put to work and we all hoped the tent would last the night. With a base camp established, we cooked up a pretty delicious pesto pasta dish and made one final excursion for the day. This would turn out to be a bit of a highlight for myself and posed an ever present question in regards to how I travel. 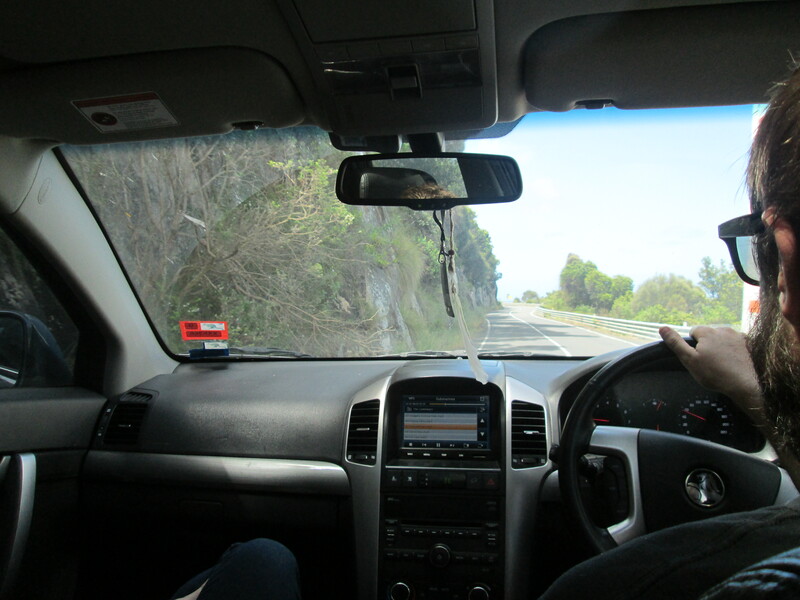 Kyle took to the wheel once again and we took a short drive out to Melba Gully. Parking up in an empty car park, we walked in almost total darkness down towards the Johanna river. The plan was to see a visual spectacular; glow worms. Every so often, we’d stop, kill the torches and wait for eyes to adjust in the hope that we’d catch a glimpse of some luminous larvae. After stumbling through the darkness, the roar of Anne’s Cascade a constant presence we suddenly found a wall to our left lit up like the sky at night. Of course, photographs were attempted. I always think of the blog and sharing as much as I can, but sometimes it just can’t be done and perhaps in other circumstances I’d be better to enjoy the moment and let the words do the talking. As we continued our walk in the dark, a mild anxiety set in as we had no idea where we were going, or if we were still on the trail and if we’d ever make it back to the car alive. Obviously, we were fine in the end and made our way back to the campsite. Once back, I happened to look up at the sky and receive a pretty similar view to the one which I’d had along the walls of Melba Gully. The lack of light pollution in this part of the world is quite incredible. Within the boundaries of Melbourne I’ve hardly seen any stars, the sky is often shrouded with clouds and lit up in an eerie orange glow. However, out in the bush, the night sky was fantastic. I can’t think of a time when I’ve had a better view whilst cleaning my teeth. After the long day, it was time to hit the pillow. We started up early the next morning. 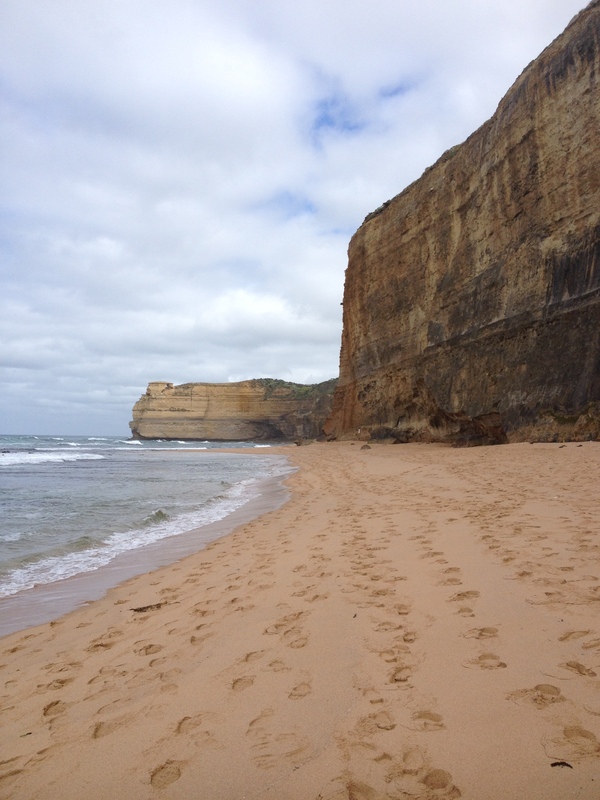 I began with a walk along Johanna beach. It’s been a long, long time since I last spent a night with the sound of the ocean breaking over the shore and I was keen to have a look at the source of the sound. 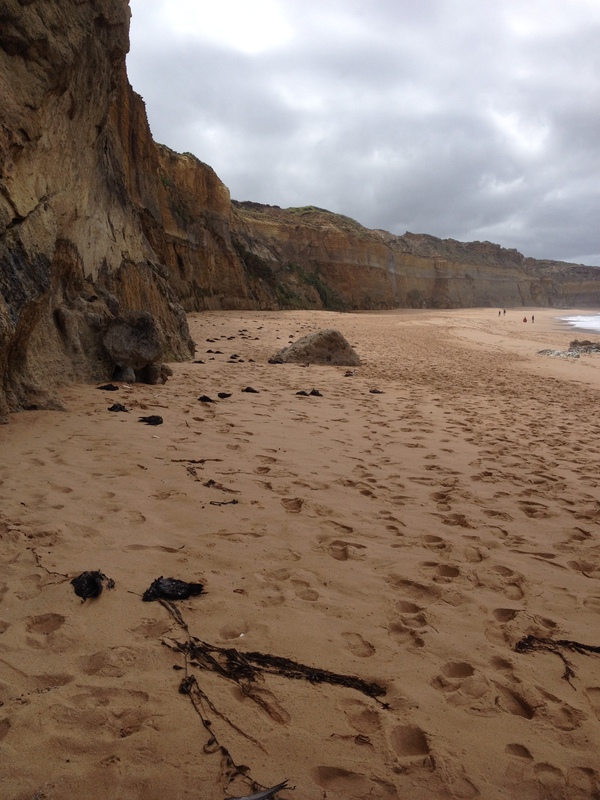 The beach stretches off in both directions, cliffs rising in the distance. 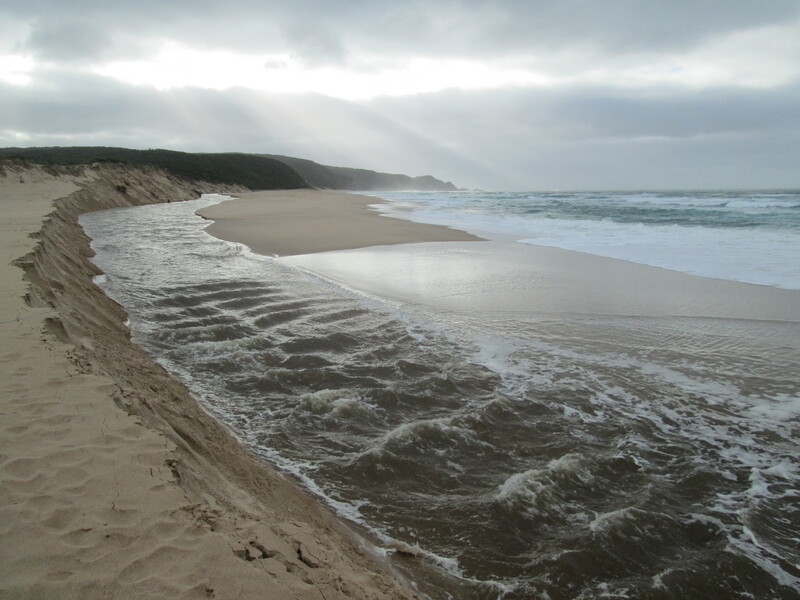 The Johanna river flows through the sand dunes and into the ocean and I was fairly impressed with my surroundings for my first camping trip in Australia. 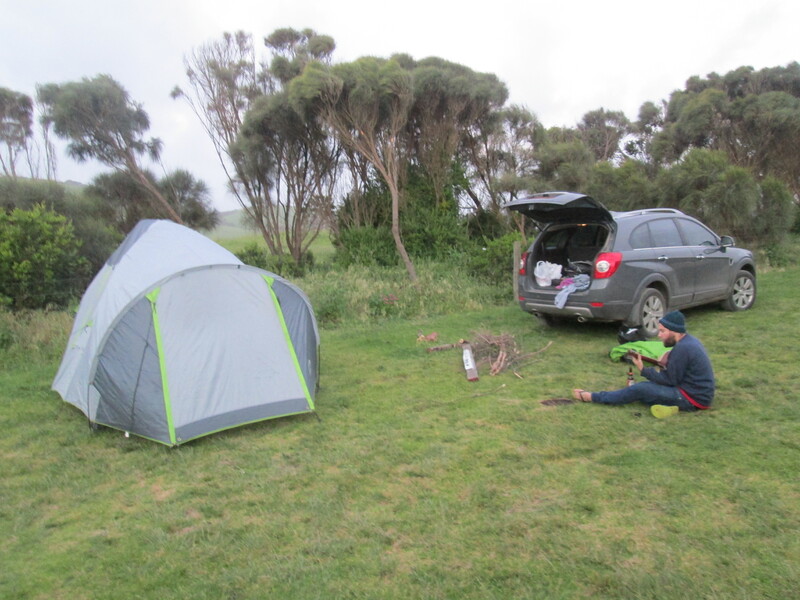 I headed back to our tent, where the others were emerging and we packed up and drove off to complete the journey down the Great Ocean Road. The road straightened out the closer we got to the 12 Apostles and spirits were high as we reached the Gibson Steps, so high in fact that I just started walking along the Great Ocean Walk in the very much opposite direction of where I wanted to be going. It didn’t take long for me to realise and I headed back to the car park and towards the steps down on to the beach. Once down the steps, the cliffs above looked colossal and we had our first sight of the stacks that have become known as the 12 Apostles. Despite our high mood, the beaches we’d been too have been riddled with disaster. Along every tide line we’ve seen the bodies of hundreds of dead birds. Apparently, these sea birds are used to stopping in China on their migration route but due to a food shortage they continued their flight until exhaustion set in and ended up broken along the beaches. That slightly sad undertone aside, the beach was quite incredible. 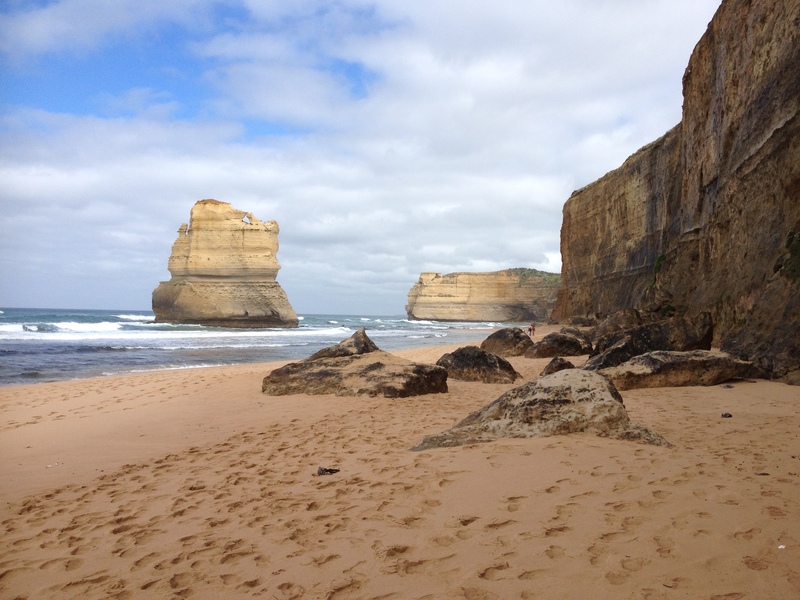 The towering cliffs, the crashing waves, the crunching sand underfoot all combined to make me feel absolutely tiny. 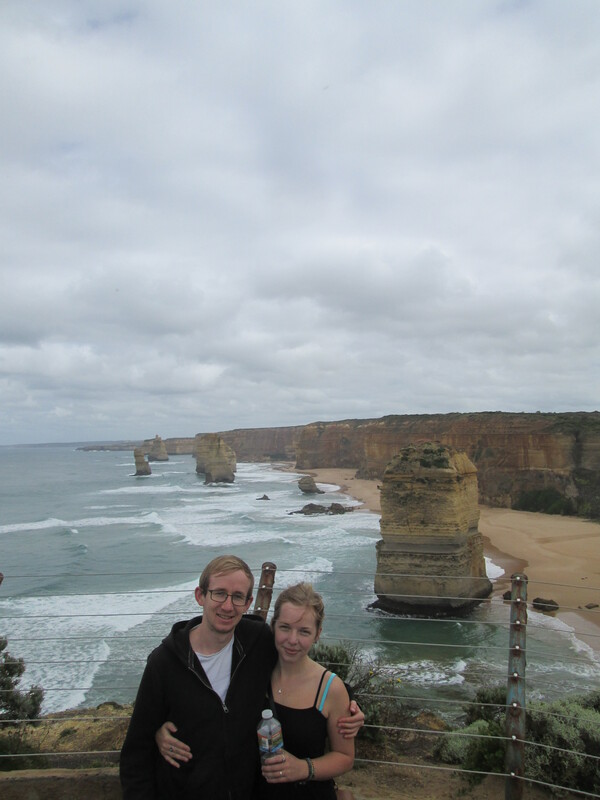 After taking in the awe imposed upon us by the scenery, we made our way a few hundred meters along the coast to the 12 Apostles visitor centre. I guess that this is what everyone comes down to the Great Ocean Road to see, the sea stacks that tower in front of the cliffs that will only stand for as long as the ocean will allow them. Even though I was provided with some rather impressive views, I felt more humbled by the size of the cliffs from the beach than by looking out across the top of the rock towers which just goes to show how easy it could be to miss your favourite part of the journey if you’re only following the crowds. On the other hand, sometimes it’s definitely worth following the crowds. 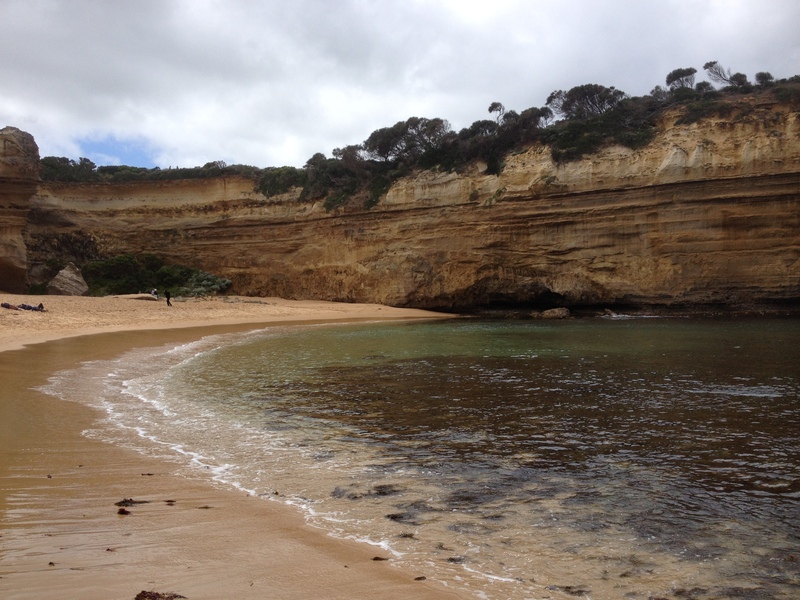 We had just enough time to reach Loch Ard Gorge before we needed to start making the return journey. I’d seen photos previously and I was certainly not disappointed by this tiny slice of paradise, the sheltered white sand cove with calm crystal blue waters and the breaking waves beyond the protective cliff walls. It was a testament to Australia’s dedication to looking after their endless supply of natural beauty. With the exception of a staircase down to the beach, the gorge remains completely undeveloped. There is a super cool cave that you can walk into and was a perfect place to stop and chill before the three hour drive which followed. Safe to say it was another top few days in Australia. 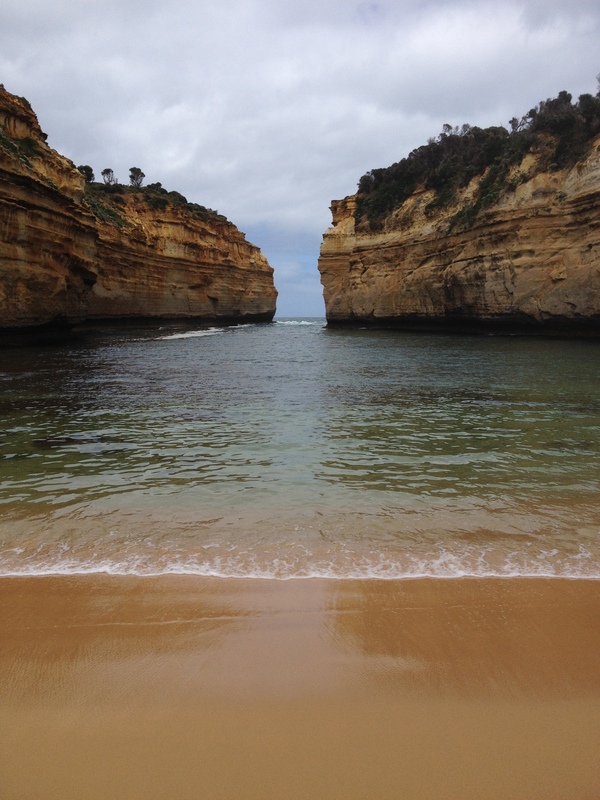 The Great Ocean Road is certainly not to be missed if you’re in the area. If you can avoid forking out for a tour that rushes you through the main sites and make your own way, I’d recommend that you do a little research and hit up the spots that most appeal to you. Who know’s what you might find. Obviously, a big thank you to Charlie, Kyle and Romina for driving and their excellent company!